When Should I Schedule My Pittsburg AC Service? You have a busy schedule, and servicing your AC unit probably isn't high on your list of priorities. 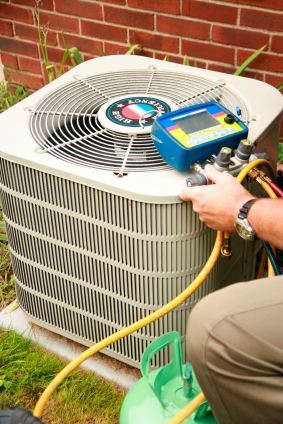 However, it's important to provide regular service to your air conditioner in Pittsburg, Kansas BEFORE you end up with expensive repair bills. Air conditioner service is the most cost effective way to keep your cooling bills down, avoid expensive repairs, or worse, needing installation of a new AC unit. Summer heat can test your Pittsburg air conditioner efficiency! It is known that a typical AC that is not regularly serviced loses approximately 5% of it's original efficiency each year. That means the powerful 12 SEER unit that you purchased just a few years ago may be running more like a 9 SEER unit, costing you more money to cool your home! Call Barone's Heat & Air, LLC for your AC service in Pittsburg, Kansas and surrounding areas, and find out why we're the area's preferred air conditioning service company. We'll schedule our service call around your busy schedule and perform a full service and equipment check at a price that will make you smile. Barone's Heat & Air, LLC can also repair AC problems or worst case install a new AC unit.